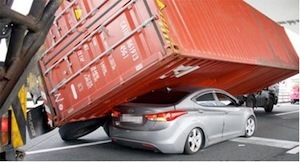 Truck Accident Personal Injury Lawyers in Fillmore, Calif: Over 40 Years of Experience You Can Depend on! Are You Searching for Best Lawyers for Your Truck Accident Personal Injury Claim in Fillmore, Ventura, Calif? There are many trucks on our roads that are being manned by tired, inattentive and negligent drivers, who place motorists at a high risk. Terrible accidents with catastrophic injuries result from large, heavy trucks colliding with smaller cars and even motorcycles and bicyclists. Our Fillmore, Ventura County truck accident lawyers and law firm provide expert personal injury and wrongful death legal services for those injured, and the families of those killed, in accidents involving a truck, car, motorcycle, pedestrian and other personal injury claims. Please visit our Truck Injury Accident Web Site to learn more about the truck accident personal injury claim process and please call us at 818-222-3400 or 866 INJURY 2 or click here to contact us for a FREE case evaluation about your specific case. A small city in Ventura County in the Santa Clara River Valley, Fillmore is primarily an agricultural area with rich and fertile soil, and is located within a historic agricultural and tree-farming belt. The small valley town lies below the San Cayetano Mountain Peak with an approximate population of 15,002 according to the U.S. Census 2010. In 1887, Southern Pacific built the historic railroad through the valley. The city is named for J.A. Fillmore, who was a general superintendent for the company's Pacific system. Noted residents of Fillmore include Nati Cano, a Mariachi musician, former leader of the Grammy Award-winning Los Angeles-based mariachi ensemble, called Mariachi Los Camperos. Accidents involving trucks, large commercial vehicles and big rig vehicles in Fillmore, Ventura County, Calif. can prove to be quite disastrous, even leading to fatalities with wrongful death accident claims in many cases. Truck crashes are often much worse than small car collisions or accidents because of the large size, weight and force of a truck. So, for experienced and compassionate attorneys to provide expert truck accident legal counsel, choose our trustworthy personal injury lawyers who handle truck accident, car accident and other injury claims in Fillmore, Ventura and everywhere else in California. We are backed by over 40 years of experience in successfully handling thousands of truck accident, car accident, pedestrian and other personal injury claims and wrongful death cases throughout Fillmore, Ventura, Los Angeles, the San Fernando Valley, Riverside, San Bernardino and all of California. Our truck and car accident lawyers and law offices concentrate on successfully resolving Personal Injury Accident Cases, not divorce, criminal, probate or other non-related matters! It is so easy to contact our Fillmore truck accident injury lawyers and legal team now for a completely FREE CONSULTATION and CASE EVALUATION. You can even call us on our Toll-Free number - 866 INJURY 2 or 866-465-8792 (after hours, again please press 1). Our consultation is absolutely FREE and we work on a contingency fee basis – which means there is NO fee until you WIN!!! FREE CONSULTATION & CASE EVALUATION and NO FEE UNTIL YOU WIN!